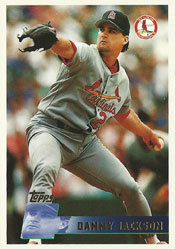 In a season fraught with futility, the pitcher who epitomized the plight of the 1995 Cardinals was Danny Jackson. Expected to provide wins and hope, Jackson instead represented losses and despair. On July 2, 1995, Jackson was the losing pitcher for St. Louis against the Cubs at Chicago, dropping his season record to 0-9. Jackson became the first Cardinals pitcher to start a season 0-9 since Art Fromme in 1907 and the first Cardinals pitcher to lose nine in a row since Bob Forsch did so from July 5 through Aug. 19 in 1978. A left-hander, Jackson was signed by the Cardinals as a free agent in December 1994 after posting a 14-6 record and 3.26 ERA for the 1994 Phillies. Jackson had pitched in three World Series for three different franchises (1985 Royals, 1990 Reds and 1993 Phillies) and had been a 23-game winner with the 1988 Reds. Cardinals general manager Walt Jocketty gave Jackson a three-year contract for a guaranteed $10.8 million. “Danny Jackson gives us the toughness we’ve lacked in our pitching staff,” Cardinals manager Joe Torre told the St. Louis Post-Dispatch. Jackson, 33, who underwent thyroid surgery during the off-season, started poorly with the 1995 Cardinals, yielding four runs or more in each of his first four appearances. Jackson had complications with his medications. He also was hampered by an unsteady defense and erratic offense. Still, Jackson’s ineffectiveness was his own doing. His pitching mechanics were out of synch. His ERA after his ninth loss was 7.83. Jackson gave up three or more runs in an inning 11 times in his first 11 starts for the Cardinals. He was unable to last longer than five innings in eight of those starts. Five days after his loss to the Cubs, Jackson ended the streak in spectacular fashion, shutting out the Marlins on a four-hitter on July 7, 1995, at St. Louis. “I feel like I got King Kong off my back,” Jackson said. Jackson won his next start, beating the Phillies, and then lost three decisions in a row. In his last start of the season, Aug. 11 against the Padres, Jackson injured an ankle, was lifted in the second inning and didn’t pitch again in 1995. His season record: 2-12 with a 5.90 ERA. In 19 starts, Jackson yielded 120 hits in 100.2 innings and had almost as many walks (48) as strikeouts (52). Batters hit .303 against him. His failures were a key factor in the Cardinals having a 62-81 record. Jackson never recovered. In three seasons with the Cardinals, he was 4-15 with a 5.78 ERA. On June 13, 1997, the Cardinals dealt Jackson, pitcher Rich Batchelor and outfielder Mark Sweeney to the Padres for pitcher Fernando Valenzuela, outfielder Phil Plantier and third baseman Scott Livingstone.